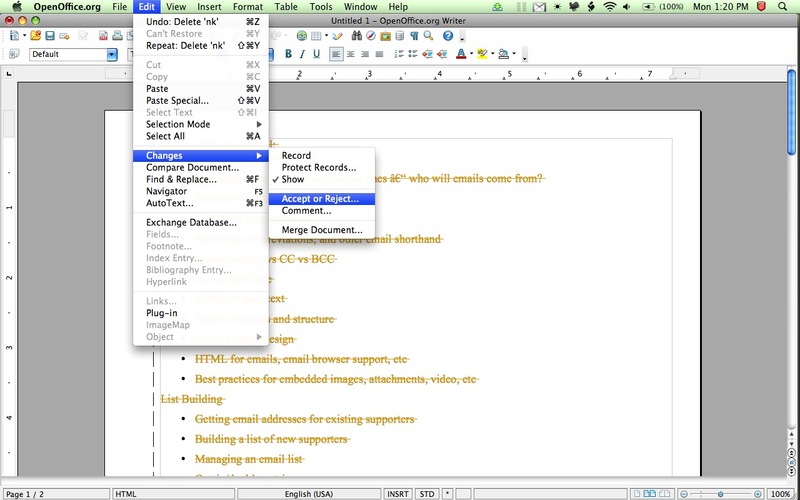 Open Office is a productivity suite that includes a word processor, a spreadsheet program, presentation software as well as an illustrating program. Open Office has many features that make it a standard tool among open translators. Open Office is used primarily for administrative work with regard to word processing, spreadsheet calculations and presentations, however, Open Office can also be used as a translation tool. Many translators use text editors as a base tool and Open Office offers significant features for assisting translation work. One such feature is the ability to record changes within a document. In translation, this is useful for tracking changes throughout the different versions of the document or text. Open Office's "Record" feature that includes comments and the ability to accept and reject changes as well as the "Compare Document" feature are useful additions to the translator's workflow when translating within a word processor. Another feature useful for translation is the ability to open and save files in a variety of formats. For example, if a colleague sends a version of a translated document in Microsoft Word format, OpenOffice is able to open and save the format so that conversion is less of an issue.